When you want to save money on your online purchases, you should stop spending instead of relying on unfamiliar applications. ThisCounts comes across as a useful tool that can provide with various shopping discounts and coupon offers. However, we have seen too many similar adware programs to believe it. Rather than helping you save money, ThisCounts will inadvertently expose you to corrupted content that might lead to serious computer security problems. Therefore, to prevent this from happening, you have to remove ThisCounts from your computer immediately. Do take your system security seriously. Some users may think that ThisCounts cannot do any harm because it simply displays commercial advertisements. Have you ever thought HOW it displays those ads? ThisCounts tracks your web browsing habits to figure out what you usually search for online. When an adware program figures it out, it generates relevant content for commercial advertisements. If you have recently searched for iPhone or iPad, do not be surprised to see tons of ads that offer you to purchase one at a lower price. However, even if these ads do seem believable enough, you should NEVER click them. ThisCounts is very similar to CouponMeApp adware application. What is more, some of its files might be detected as constituent parts of websearch.com hijacker or FindWide adware application. There is nothing reliable about ThisCounts, and you should get rid of it ASAP. This program is slightly different from standard adware applications, because its direct download link is available at thiscountssoft.info. Generally, adware homepages are nothing but empty shells, but in this case thiscountssoft.info is one of ThisCounts distributors. Needless to say, that the official homepage is not the only place where you can download this program. Such coupon apps often travel bundled with similar programs, so if you do not remember installing ThisCounts on your PC, chances are that it was installed automatically with a list of other unwanted applications. Any security-minded user knows that the adware applications are no good. ThisCounts may not try to infect you with malware directly, but you cannot rule out the possibility of the malevolent exploitation. After all, ThisCounts uses third-party advertising networks to create ad content, so it cannot be liable for potentially malicious third-party content. 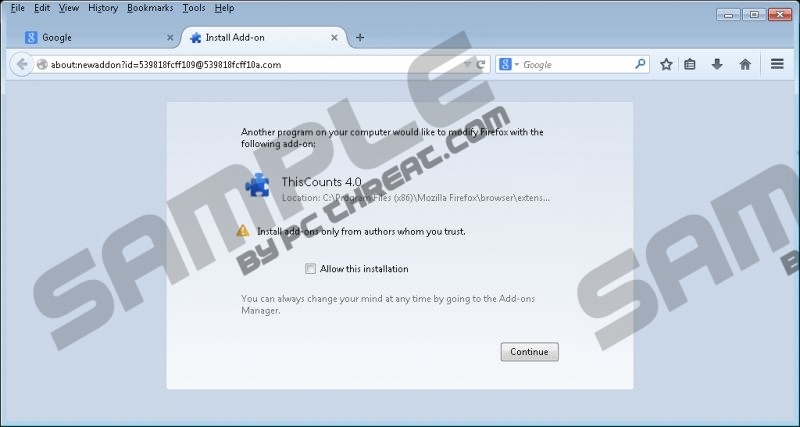 You are strongly recommended to remove ThisCounts from the PC along with other unwanted adware applications. If you do not know how many unwanted programs you have on board, scan the system with SpyHunter free scanner. An extensive list of unwanted programs will be generated at once, and you will be able to get rid of them all in no time. After manual removal, be sure to acquire a licensed antispyware program that will safeguard your PC against any potential threats. Also, if you have any further questions, you can contact us by leaving a comment in the box below this description. Select Uninstall a program and remove ThisCounts. Select Add or remove programs and uninstall ThisCounts. Quick & tested solution for ThisCounts removal.